A dessert trolley full of puddings made on the premises tops off a surprisingly rich experience. The sort of value that makes Londoners weep in frustration as they contemplate that city’s overpriced, pale imitations. A tiny restaurant with some of the most imaginative cooking to be found in Venice. Now really a bar / pizzeria rather than a full restaurant, the prices have changed along with the management. 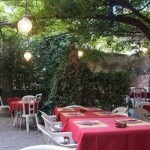 Large restaurant near Campo dei Frari, also within striking distance of both the station and Piazzale Roma.